Our resident TV expert Steve May has had hands and eyes on the OLED R and is impressed. And let us tell you, Steve is not easily impressed. In his review, he praised the OLED R's visuals. Little wonder, as the panel and image processor are the same as in the stunning OLED C and OLED E ranges that have helped LG dominate the OLED television marketplace. Equally impressive is the Dolby Atmos-enabled sound system, which pumps out 100W of audio power from 4 main drivers and a pair of subwoofers. With the screen fully or partially lowered, the LG OLED R can be used as a Bluetooth speaker – track info is displayed when the screen is partially raised. 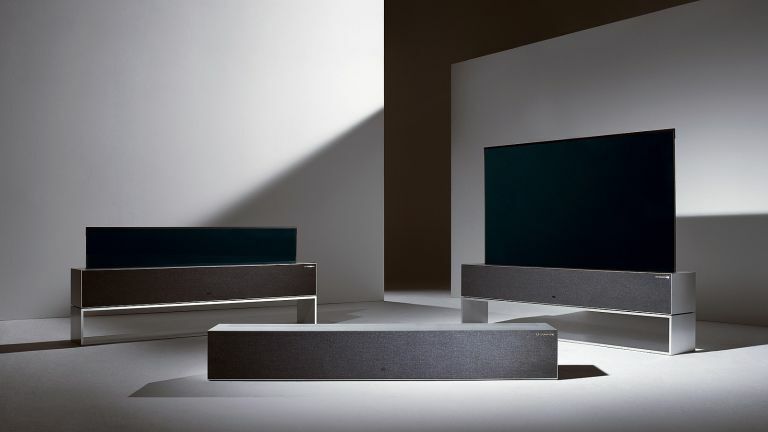 The audio cleverness doesn't end there, as LG's AI will 'upscale' stereo audio to an approximation of 5.1 that Steve found surprisingly effective. We must be living in the future: LG is working with Apple! Almost as miraculous as the OLED R's raising and lowering mechanism, which LG's engineers are confident will last for the life of the TV, is the fact that Apple HomeKit and AirPlay 2 are built into the smart TV platform. The Apple smart home controller and audio/video streaming system are also coming to Samsung's 2019 TVs, which would have seemed almost unthinkable, this time last year. LG OLED R: HOW much? LG hasn't announced pricing yet, but TV experts have been racing to outdo each other with predictions of possible expensiveness levels. According to Steve May, these range from a daunting $15,000 to an entirely crushing $50,000. That's the premium you pay for being an early adopter, sadly, but there is hope for those who don't have tens of thousands of pounds lying around: the prices of most recent, new TV technologies have come down drastically in just a few years after their introduction. So maybe by 2021, we'll be saying, "Yet another roll-up TV? How terribly two years ago…"